Prior to a most beautiful sunset. 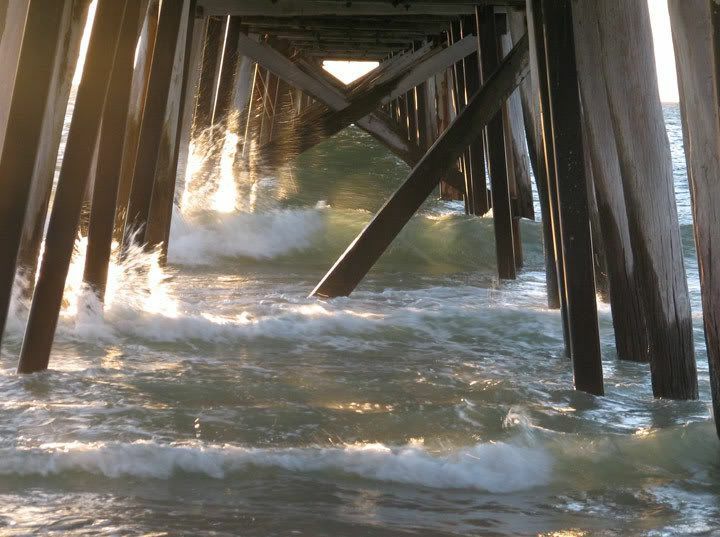 You get a good sense of the length of this pier from your depth of field Jan. It looks like you got some light intrusion on the lefthand side which has meant some loss of detail in the uprights. I like the water spray through the sun beams. Thanks for looking and commenting, I have lots of different shots of this, but what I was aiming for was the light through the spray and this one I got it. The sun was almost down. I will sort out another one for you Stewart. This is a really nice shot Jan. I have never seen a pier so up close and personal. Thanks Tracy, I was just above the waterline, you can sit on the sand in the shade higher up the beach. We have a choice of 6 along the local beaches.